This clever little collar is designed for your pet's comfort and safety. Should the collar catch on anything during the course of your pet's play or exercise, the magnetic clasp will release, and no harm at all will come to the animal. 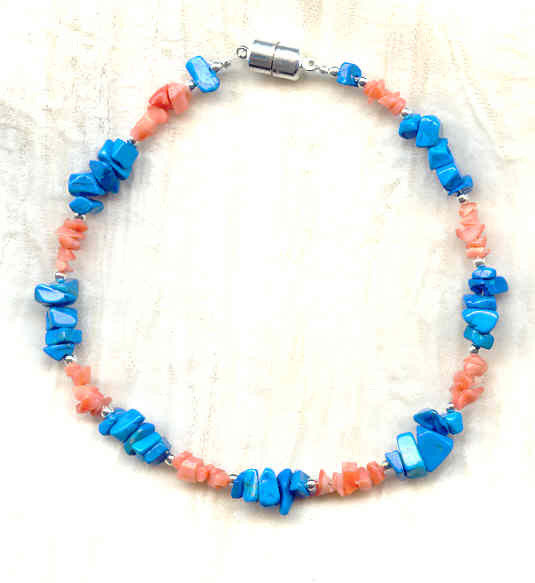 Better even than that, the collar is quite lovely, featuring turquoise howlite and coral chips and tiny silver tone beads. The collar measures about 10" long. The second image is a candid shot caught by chance of that famous mattress-tester, cat-about-town, and noted fashionista, Gorbie, wearing a similar turquoise howlite and coral collar. Now even our beloved critters can sample the joys of SPARKLE PLENTY jewellery. All of our one of a kind and limited edition artisan beaded jewelry is individually handcrafted in our studio in Los Angeles, California. Our indie boutique jewelry styles and fashion accessories make fabulous gifts. Bracelets, necklaces and earrings in beautiful contemporary, vintage, antique and retro designs. All designs, text and photos copyright Sparkle Plenty Fine Beaded Jewellery 2002-2011 and may not be reproduced in whole or in part without prior, express written permission. All rights reserved. White howlite has an interesting grey matrix which makes it the perfect companion for dark grey hematite.